Kapil Mudholkar, Editor, The Hash Mag, got into an exclusive interaction with Mr. Brian Pinto, Country Head, I-AM, a design-led branding agency to know more about their recent project to handle the design for Flipkart’s new workspace in Bangalore of over 837,000 square ft. area. Please tell us more about this project. Flipkart has been growing at a rapid pace and it had employees operating out of multiple offices. Its move to a new campus was to bring all its different teams together in one workspace. The environment branding and space intervention mandate to I-AM to ensure the new 8,37,000 sq. ft. campus embodies the values, culture of the company and its people. This is a massive workspace design project. A lot must have been conceptualized or brainstormed to give this project a shape. Would you like to share your experience on overall lifecycle of this project? We conducted interviews with key Flipkart stakeholders and determined that there was a need to encourage collaboration between Flipkart’s diverse departments. Additionally, space needed to be vibrant, dynamic and inspiring to appeal to every Flipster. We also studied benchmark international workspaces to understand design trends and success metrics. The concept imbibes the core Flipkart brand ethos. 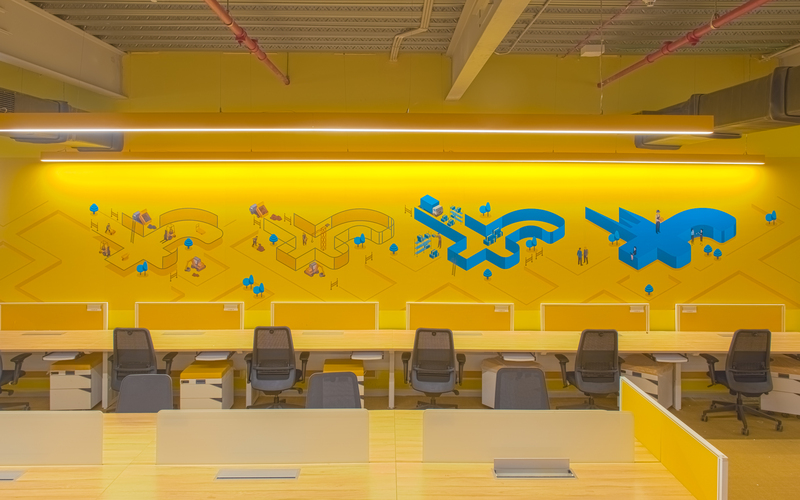 I-AM has raised the bar on work-space branding in India with this project. Thanks to a great client team who worked with us. Are you facing any kind of challenges? The challenges faced during this project revolved around the large scale of the workspace. This encouraged us to push boundaries creatively and design for the 7000 employees that will be using the space. We had to ensure that there was consistency in the overall story, while providing enough variation to keep the space engaging and intriguing as people move through different areas. Since the surfaces were so large, we had to work with scale closely to achieve impact while remaining in tandem with the architecture of the space. We also wanted our designs to encourage collaboration in such a large space. Our way-finding program was essential to help people navigate through the space, while adding energy and vibrancy to the space. The interactive installations in common areas also encouraged Flipsters to come together and collaborate. Will this project be any specific-theme based? The concept stems from the Flipkart value of audacity, taking risks and approaching things from a new perspective to achieve innovative results. It is dynamic, adaptable in nature, and reflects the constantly changing nature of the business. The visual style adapts to different surfaces and highlights different dimensions, encouraging varied viewpoints to come together and increase collaboration. The story manifests itself in different vibrant, energetic themes throughout the floors. The Third Dimension uses isometric illustrations to create depth perception from flat surfaces. Pattern Play is a fun twist between patterns, imagery, and negative spaces. The Other Side illustrates what could be on the other side of a surface and turns things on their heads. Will this design have any influence of ecommerce business? As you move through the space, there will always be something new around the corner to see or take a closer look at. The result is a graphics program that works in tandem with the space to increase energy and collaboration. As stated earlier, the design incorporates the dynamism of the ecommerce category. The concept has also been extended to the meeting room names that comprises three new styles – rhyming words, brand colours and everyday retail shopping terms.